One of the big causes of lost shots on the golf course is not asking how does a golf rangefinder work and of misjudging the distance to a particular target. Under clubbing or coming up short is usually a symptom of indecision caused by estimating the yardage left to cover. Knowing the distance from the target that a golfer has left enables him/her to choose the correct club or lofted iron to be in with a chance of those elusive birdies. Check out Garmin X40 here. 1 How does a golf Rangefinder work? Whenever you watch a major golf tournament you will notice the professional discussing every shot with his caddie. The professional will know the distance that he can hit each club but relies on his caddie to point out the undulations and hazards as well as the distance to the target. You may have noticed the caddie has a notebook in which he has meticulously noted the yardage when walking the course prior to the tournament. A classic situation arose hi-lighting this working partnership in a major tournament when the late great Seve Ballesteros had an altercation with his caddie concerning the distance to a green. The caddie was insistent that the distance required a good seven iron, but Seve was adamant that the shot was an eight iron. Seve went with his caddie and overshot the green by ten yards. The caddie who shall remain nameless, was full of apologies and remorse even more so as they went on to finish second. Tips here to choose between a GPS watch and a Rangefinder. 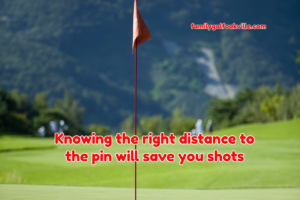 The above example shows the importance to any golfer, of whatever standard knowing the distance to the target. Strokes can be so easily lost by silly mistakes, which then lead to more uncertainty and lack of confidence. More tips here on driving the ball. Well, nowadays we have available the next best thing to a caddie, a range of yardage devices which if used properly will build your confidence and cut your scores. There are three systems available for golfers to measure distance on the golf course when playing a shot and these are an optical viewer, a GPS satellite control, and a laser rangefinder. The optical viewer works on the principle of viewing the height of the flagpole which is then converted to pre-loaded distance charts. It is important to focus with a steady hand to get best results. The cost of the optical viewer is considerably less than the other two options but the degree of accuracy is also something that needs to be considered. Improve your putting with these tips. As the name suggests these devices are controlled by satellite and can be purchased in the shape of a watch which can be worn on the wrist or can be purchased to be clipped on your belt or attached to your golf bag. Care should be taken in choosing this option as there are several manufacturers producing models, some are pre-loaded with courses some have to have courses downloaded and updated from your computer. Both watch and clip-on, display the layout of the hole with distances and hazards but the size of the screen and hence the readability will vary. This is the most accurate of the options and again there is plenty of choice from a range of manufacturers. The basic workings are by picking a target through the viewfinder and locking on by pulling a trigger, which releases a laser beam. Within seconds the laser is returned from the target giving a distance that is accurate in some models to six inches. Care must be taken in holding the rangefinder still to make sure the right target is locked onto. This type of laser Rangefinder tends to be more expensive compared to the other two, but as with all new technology, as more manufacturers are producing new models there are bargains to be had by the canny shopper.